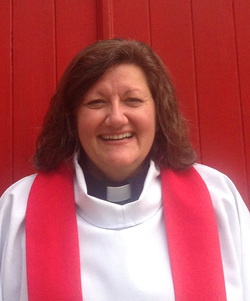 Pastor Tonya Brittain is the pastor of First English Lutheran Church, and is available for pastoral care in times of need. The pastor's posted office hours are Monday through Thursday, 9a - 11:30a and by appointment. She can also be reached by cell phone at 828-228-4818. The pastor's brief personal history: First English called me in January, I began service here on March 16, and was officially installed April 10 of 2016. A life-long church servant through music, God led me to Hood Theological Seminary, Salisbury, North Carolina in 2010. Together with Lutheran Studies at Gordon-Conwell Theological Seminary, Charlotte, North Carolina, a Master of Divinity was achieved in 2014. 2015 was spent on internship at Joy Lutheran in Richmond, Texas. My husband Gene is an accountant with Honda Logistics and an organist, and we have two Godsons. It is an honor and humbling experience to serve Christ, and I would warmly welcome you into our midst.